2420 Aircraft Control & Warning & Unit (Reserve) London was formed on 15 June 1951 under the operational control of Training Command. On 1 August 1951, they were operationally responsible to Air Defence Command. On 1 November of that same year, they changed their designation from Reserve to Auxiliary. The personnel and equipment, the AMES-11C radar, for the new unit came from the Radar Section of No. 420 (F) Squadron (Reserve). 2420 AC&WU was disbanded on 1 November 1951 but was reformed as 2420 Aircraft Control & Warning Squadron (Auxiliary) on 1 July 1956 at their old home, RCAF Station London. On 30 September 1958, RCAF Station London was closed so RCAF Station Centralia was tasked to provide logistic and administrative support to 2420 AC&W Squadron. Narrative reports on the web site verify that personnel from 2420 AC&W Squadron were active at RCAF Station Falconbridge in 1959 and 1960. 2420 AC&W Squadron also became a victim of the SAGE program and was disbanded on 31 May 1961 as its manual operators would no longer be required to assist their Regular Force colleagues. 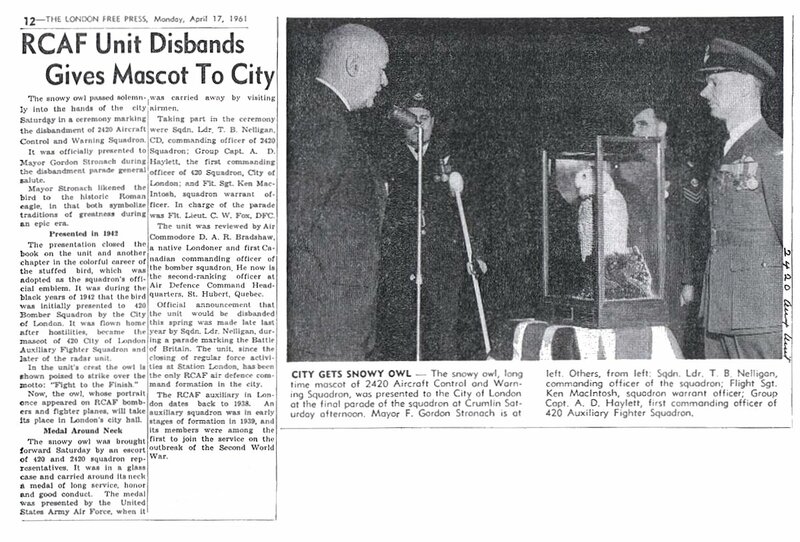 RCAF Unit Disbands - 17 April 1961. Organization Order R2.0.3 - 8 July 1958. Organization Order R2.0.22.3 - 13 July 1956. Organization Order R2.0.22.1 - 22 June 1956. Organization Order 130/51 - 20 October 1951. Organization Order 81/51 - 27 June 1951. Organization Order 42/51 - 17 May 1951.